Balsam Peru is most commonly used for topical applications for slow to heal wounds, ulcers, hemorrhoids & bedsores. As well as skin disorders like eczema, prurigo and pruritus. It has been recommended for use with chapped skin & lips, asthma, bronchitis, stress, eczema, nervous tension & rashes. It has also found a place in dentistry, being used for treatment of dry socket, also known as post-extraction alveolitis. It has also been used in dental impression materials. It is often found being used as a fixative for fragrances, soaps, perfumes, lotions & detergents. A large and beautiful tree with a valuable wood similar to mahogany, and a straight smooth trunk. Leaves are alternate pinnate leaflets. Every part of the tree including the leaves is abundant in a resinous juice. Often planted as a shade tree on coffee plantations, Balsam Peru comes from the Myroxylon tree, which literally means "fragrant wood". “Balsam Peru” is a misleading misnomer. It acquired this name because the wood was collected in Central America and then shipped to Peru, on its way to Europe. Indigenous use ultimately led this species to be exported to Europe, It was then first documented in the 17th century in the German Pharmacopedia. 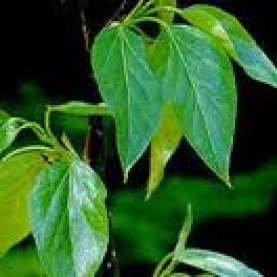 Today, El Salvador is the main exporter of Balsam Peru. The high percentage of benzyl benzoate make it effective against scabies, dust mites & head lice. Even though crude balsam is a known allergen, the allergens are not present in the distilled oil; however, Tisserand says that there is a moderate risk for skin sensitization.